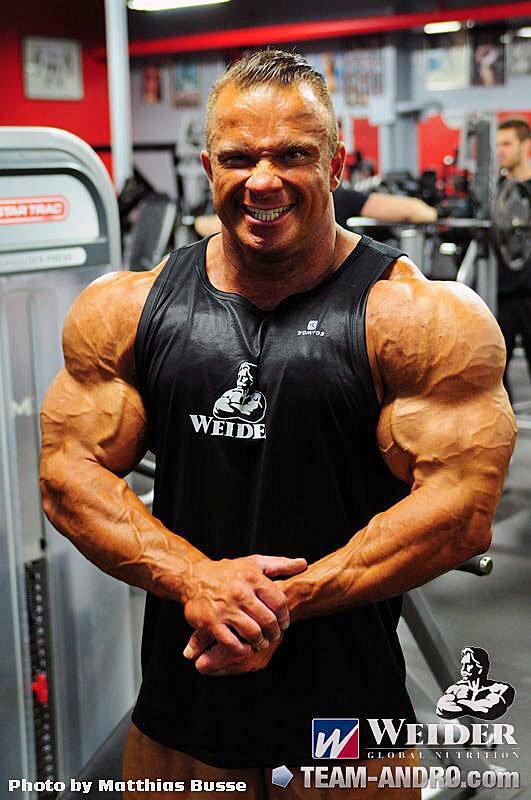 Ronny Rockel is on a methodical rise through the IFBB rankings. He placed sixth last year at the Olympia, but in 2011 he has his eyes (and massive quads) fixed on the Top-3. Top-tier pro Ronny Rockel is no longer simply a fan favorite who lacked acknowledgement by the judges, thus provoking and frustrating his supporters. Rockel is now a veritable threat to the top order within the IFBB pro ranks. In his last seven pro shows he has not placed below sixth. This year he won the Mr. Europe Grand Prix and placed second at both the FIBO Power Pro Germany and New York events. Perhaps most importantly he became a mainstay top-level competitor among the routinely-stacked Olympia and Arnold Classic lineups. This year Ronny hopes to place in the top three at the Olympia. That is perhaps a big ask, but certainly not an impossible proposition. Consider his undeniable talent and newfound ability to bring a shredded, muscle-packed physique to the pro stage. He has as balanced and proportionate a look as can be found anywhere in the pro division. Ronny Rockel, with the yearly improvements he makes and the shape he is known for, is a guaranteed draw-card for any pro event he enters. When Ronny is in town, paper NEVER beats Rock. Rockel began his pro career in 2003. He placed 18th in his first Olympia in 2005. The 5-foot-6, 203-pound German native gradually worked through the IFBB ranks. He placed well and secured a pro win at the 2006 Australian Pro, but never made it into the coveted Olympia top ten. This changed in 2009 with his 7th-place finish in the world's biggest bodybuilding showdown. Now he regularly fights for respectability among the Olympia's top contenders. Ronny's entrance at last year's Olympia stage pleasantly surprised the audience with a new and improved version of his former shape and conditioning. In 2011, he made greater progress still and promises to compete for top placements. In the following interview Ronny explains how he plans to best the world's best at this year's Mr. Olympia. Q: What improvements have you made to your physique since your sixth-place finish at the 2010 Olympia? I planned to significantly improve my back, which I have achieved. As well, I have improved the overall quality of my physique and have gained more overall muscle mass. Q: Many people feel you will again break the top six at this year's Olympia. What kind of physique do you feel you need to bring this year to again place among the top tier of your division? I have a very balanced symmetry and I try always to improve this aspect of my physique. I must simply bring a really good, full body and be ripped and hard; then I hope to be in the final six at this year's Mr. Olympia. Q: Do you think you can make it as high as top three? Why, or why not? Hopefully I can do that! I believe I have everything one needs to be in the top three. And with God's help I will succeed in achieving this aim. Q: At last year's Olympia you brought the best combination of size, shape and definition of your career. Do you think it is possible to improve upon this look? How long do you feel you can continue to make improvements? I do not believe I will stop improving. I know that I have improved from last year and I can continue to make further improvements as I compete in this sport. I work hard for quality size and continue to believe that my back will become larger still. Thus I would like, in particular, to build greater back size and shape. from Rockel in the future. Q: Why do you think the Mr. Olympia contest is considered to be more prestigious than other pro bodybuilding events? This is a simple question to answer. The Olympia is the highest contest. Here we have the best of the best against which you can measure your success. Everything begins with Weider and the Mr. Olympia; the remainder is history. Q: How long would you like to continue competing at Olympia level? For as long as I can achieve high placements in this event and continue to make improvements I can measure. I would like to participate in the Olympia ten times and become better with each attempt. Q: What do you think it is about your physique that the judges like most? I think it is my quads — but you better ask the judges. Q: How do you maintain your great shape from show to show, while making gradual improvements? I simply give my best efforts when training and dieting. I pay attention to my supplement plan. And I'm always sure not to over train. I do cardio every day, mostly in the morning on an empty stomach to attack the last fat reserves. I cut it maybe one week before a contest. I am living my dream. The competition is the coronation and culmination of the hard work I put in each year. I train to reach certain goals, as do all bodybuilders. Ronny rolls over one goal, and on to the next one. Q: How would you describe your training mindset? I try always to provide my body with a different training stimulus. Importantly, the body must not adapt to any training stimulus and must always be presented with a new challenge so as to continue growing bigger and stronger. This is the way I think when I am training. Q: What kind of competitor would you describe yourself as being? I'm a fighter and I never give up. Q: In your view, what mental and physical attributes does a top tier pro such as yourself need to keep competing and placing well year after year? To triumph over all obstacles and to have the absolute will of a champion. One can only make it to the elite level with these attributes. Q: Have you made any changes to your training over the past year? If so, what have these been and how have they helped you improve your physique? I make small changes as often as I can. At this level you cannot make massive changes; it is only possible to take little steps and make subtle changes. I changed my back workout a little by adding deadlifts. But the rest is the same as always. I only change the intensity from off-season to the preparation period, where it is highest. I use amino acids and whey protein. This combination I feel is important for post-workout nutrition. It is very important! Supplementation separates the chaff from the wheat. I use Weider supplements, a lot of amino acids in every form - liquid for better absorption and powder form also. I also take glutamine, L-carnitine, magnesium and pre-workout I will sometimes use a guarana/caffeine complex. Q: This year's Mr. Olympia will host the usual top-line competitors, you included. Who do you see as being major competition for you and why? The major competitors are Cutler, Heath, Greene, Wolf, Martinez and Dexter. Why? Just look at the world ranking list. These are the best of the best. The stone-cold truth? Ronny is ready to bash his way to a win. Q: What are your major strengths as an IFBB pro competitor? This is surely my very balanced body. I have very good symmetry and, additionally, my quads, which are a standout body part for me, are among the best. Q: Where do think you will place in the 2011 Mr. Olympia? I am hoping for the top three. Q: What message would you like to give to your fans, those who will be coming to watch you compete at the 2011 Olympia? Thanks for all the support from the fans from all over the world! This motivates me to give the best I can. I'm happy about the great response I get on Facebook or via email. I will give the best for all my fans out there.